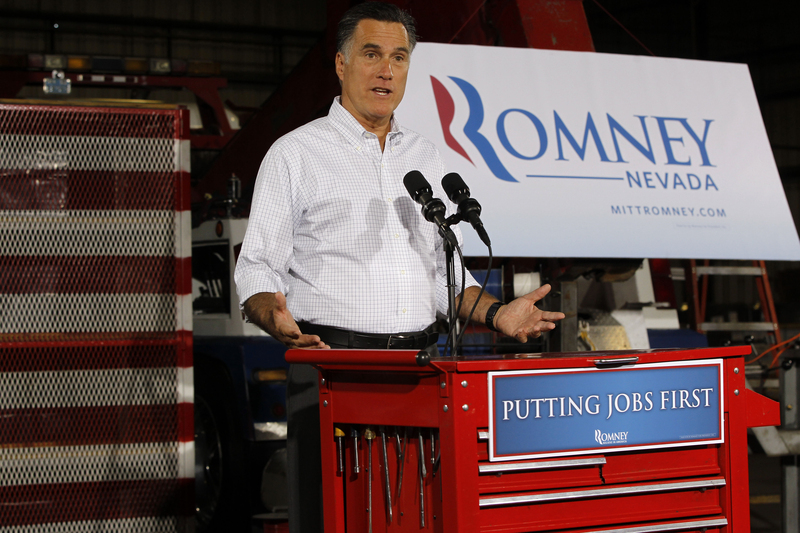 (CBS News) NORTH LAS VEGAS, Nev, - Presidential candidate Mitt Romney called Friday's unemployment report "another hammer blow to the struggling middle class" as he slammed President Obama for failing to improve the economic outlook. But he stopped short of saying the country was in another recession, saying that question should be left to economists. The report showed that the tepid economy added 163,000 net jobs last month, per the Labor Department's survey of business payrolls. A separate survey of households showed nearly 200,000 job losses, pushing the unemployment rate up from 8.2 percent to 8.3 percent. "This is an extraordinary record of failure," Romney told a crowd of several hundred voters who gathered at a trucking company. "The president's policies have not worked because he thinks government makes America work. He's wrong." Speaking with reporters afterward, he termed the economic situation a "moral failure" for a country as prosperous as the United States to have gone so long with persistent unemployment. While he demurred to professional economists on whether the country has slipped into a recession, he said that for the 23 million Americans who are out of work or underemployed, "it's a recession or them, if not worse." Since returning from an overseas trip earlier this week, Romney has sought to return the focus of his campaign to the economy. Campaigning in Colorado on Wednesday, he released a slimmed-down, five-point plan to grow the economy that focuses on energy, education, trade, deficit reduction and small business growth. He played up his business credentials, spending more time than usual discussing the companies that his private equity firm, Bain Capital, helped to succeed. He also took a jab at the president's experience, saying his own plan "is not based on spending years in academics coming up with theories, this is instead based on actually having had a job in the private sector." As he traveled in the home state of Senate Majority Leader Harry Reid, Romney's economic message was inevitably distracted by Reid's recent accusations - based on an anonymous source whom Reid refuses to name -- that the former Massachusetts governor hasn't paid taxes in 10 years. Democrats have demanded that Romney release his tax forms to prove otherwise, something he has refused to do. "Let me also say, categorically, I have paid taxes every year. And a lot of taxes," Romney said. "So Harry is simply wrong, and that is why I am so anxious for him to give us the names of the people who put this forward," Romney said, in a rare moment of rebutting the substance of an accusation against him. But he continued to refuse to release more than two years of tax returns, derided Reid for trying to distract from the weak economy and suggested that the source of the senator's information might be the White House or Obama's campaign. He has accused the president of waging a dishonest campaign despite a conversation the two candidates had earlier this spring, in which Romney said Obama wanted a debate on the direction of the country. "What we are seeing instead is one attack after the other that are misleading, false attacks," he said. On the other major news Romney could have made - his running mate - he did little more than tease the curious reporters. "I will absolutely decide and announce my running mate before the third day of the Republican convention in August. But other than that, I have nothing for you," he said. Seeking to keep the focus on economic issues, Romney avoided other hot-button topics. He declined the chance to comment on two controversies: the owner of the popular fast-food chain Chick-Fil-A denouncing gay marriage, and Rep. Michele Bachmann alleging that a top aide to Secretary of State Hillary Clinton, Huma Abedin, has ties to the Muslim Brotherhood (which has drawn Bachmann condemnation from Sen. John McCain and other Republicans). "I'm not going to tell other people what things to talk about," Romney told reporters. "Those are not things that are part of my campaign."